WELCOME TO THE LAST SAFE PLACE ON EARTH! The above-ground home is 2,000 square feet. But if you use the keypad entry to the basement, you’ll find 2,300 more square feet that were a former launch control center. It has been converted — with dining and entertainment space and two bedroom suites — complete with marble bathrooms. It has 10-foot tall ceilings, simulated daylight — and what we all need in our post-apocalyptic home — an open floor plan. Basement entrance. Good solid construction. Inside the basement house. it’s a whole new world! Tunnel to the silo. This could use a little work. Maybe some paneling? Inside the missile silo is a 9-story structure, currently empty. Consider it would be perfect for underground condos. Bring your friends on board and recycle that air! It used to be selling for a mere $1.7 million. If it hasn’t sold by now, maybe we could make a deal? I thought the big, 9-story missile silo had real potential. I’ll stick with the above ground dwelling, thank you. Would die of boredom, so would probably be better opting for quicker death in the apocalypse. Plenty of room for all of us! I’m guessing that post-apocalypse the view won’t be as stunning, though. Sadly true, though you never know. 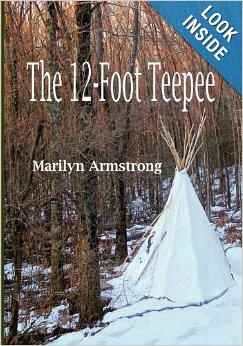 The Adirondack Mountains wouldn’t normally be a target, but the radiation is bound to twist something into new and exciting shapes. I’ll have it. How much is it now? I honestly don’t know. I can only find old versions of it online. Oh sure, it looks nice and all, but did they think of the basics like food, water, air, and electricity? 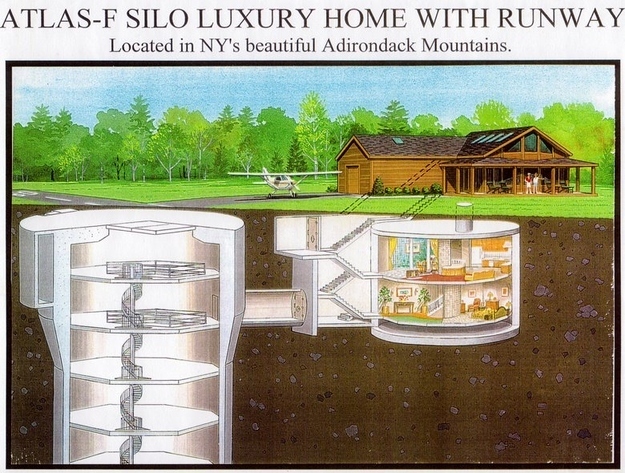 I’m just assuming you could really pack that 9 story missile silo with just about everything. Too many stairs. Why couldn’t they have used a slide to get to the bottom. On the other hand, we didn’t need them many years ago. I don’t think we’ll need them this time either. Send the youth to the bottom. Oldsters hand on top! It’s comforting to have a plan. Especially one that depends on yet un-purchased real estate. Forget about getting to the bottom.., how do you get back UP from the bottom. These days the legs, heart and lung conglomerate are not what they used to be. I think I’ll just stay where i am and wait for the BOOM! Would be good for ye olde Zombie Apocalypse too. That is amazing! I am not one to be too prepared for the “end”, but if I were…that is exactly what I would want! Very cool. Zombie apolocalypse, here we come! What’s all this talk about Zombies.., There is no such thing…, right? Wait!, I heard a noise…. I love it!! Love those stairs. Cool media room! But will there be any media? Maybe we could have a library in the silo. Hey, nine stories of silo space. Library. Media library. Audiobooks. We’re going to NEED it. Previous Previous post: ODDBALL PICTURES CHALLENGE TIME!